Dreaming of a relaxed getaway with your significant other? Maybe you're wanting to wine and dine in the world-class Barossa Valley, or maybe you'd fancy exploring the east coast of Tasmania instead? From Western Australia's Great South West Edge, the quaint and luxurious Sunshine Coast Hinterland, to the tropical Great Barrier Reef Drive, your opportunities are endless when it comes to road trips for couples. Hire a car with VroomVroomVroom and start exploring the magic that is Australia with your loved one. From Perth to Esperance, the Great South West Edge like its name states, follows the south west coastline of Western Australia. Known as one of the most stunning road trips in Australia, this amazing getaway is an idyllic beachy 11-day adventure and is the epitome of a perfect couples road trip. Check out the insta-worthy beaches: From Greenspool, a mint green tropical and natural pool in William Bay National Park to Lucky Bay, a white sand beach that is home to countless kangaroo's, you'll see why Australia is famous for its coastlines. 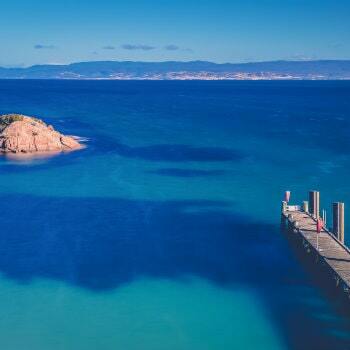 Other must-see beaches include The Gap and Sugarloaf Rock. You'll also be able to see Lake Hillier, a bright pink lake that is situated right next to the coastline of Esperance. For the ultimate couples experience, take a helicopter ride to see this picturesque view from above. National parks are aplenty and are a perfect adventure to go on with your partner. Top contenders include Torndirrup National Park (you'll find The Gap here), Fitzgerald River National Park and Cape Le Grand National Park. Directions: You can fly into Perth Airport and pick up your car hire. From there drive south west to Esperance. 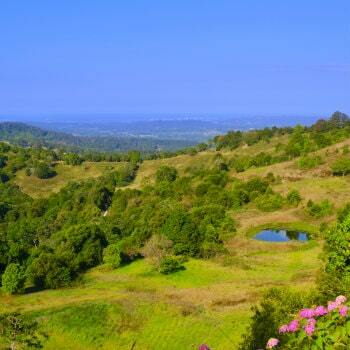 Take your partner on a Sunshine Coast Hinterland getaway for the ultimate romantic road trip. Located only an hour and a half from Brisbane, you'll be in awe of the rainforests, restaurants, and relaxed vibes. There are countless accommodation options on the Hinterland. Popular locations to stay include Montville and Maleny. From Cottages to luxurious retreats, you'll feel spoilt for choice when you come here. The Hinterland is famously known for its stunning views that stretch out over the Sunshine Coast, all the way to Brisbane. Make sure to check out the lookouts dotted along the hinterland. The Great Walk is located right here on the Hinterland. Stretching for 59 KM, there are stunning mini walks that you can check out. We recommend Kondalilla National Park and Mapleton Falls National Park for a taste of the dreamy scenery and flora and fauna. Directions: You can fly into Sunshine Coast airport and drive to the hinterland. Take Airport Drive to North Shore Connection Road. Take Sunshine Motorway/State Route 70, Maroochydore Road, Nambour Connection Road, Woombye Palmwoods Road and Hunchy Road to the Hinterland. 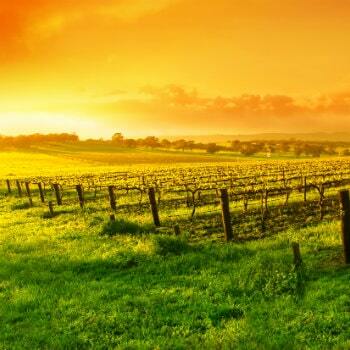 The Barossa Valley has to be the epitome of a couples getaway and for good reason. Not only is South Australia filled with beautiful weather, world-class restaurants, and wine - the drive from Adelaide to the Barossa is gorgeous. Wine, dine and treat yourselves! Make sure to visit Fino Seppeltsfield and Stein's Taphouse for delicious food and, Penfolds, St Hallett and Peter Lehmann for amazing wine. Check out the Barossa Farmers Market and go for a bike ride around all the different wineries. No matter what your fitness level is, there is something for everyone. Grab a picnic and find a cute location to relax! Once you have explored the must-see areas of the Barossa, it's time to get in touch with nature. There are some lovely national parks nearby, including Hale Conservation Park and Sandy Creek Conservation Park. Directions: You can fly into Adelaide airport and take National Highway A1, National Highway A20 and Gomersal Road to the Barossa Valley. Fancy a tropical getaway in Far North Queensland? From scuba diving in the Great Barrier Reef to exploring Daintree, one of the oldest rainforests in the world, you and your partner will be able to check out some of Australia's most iconic destinations. The Great Barrier Reef Drive stretches from Cairns to Cape Tribulation. If you fly into Cairns airport, and drive to Port Douglas, you will be able to experience a section to the Great Barrier Reef Drive straight away. To your left will be the stunning ocean and to your right will be mountains. After checking out the Great Barrier Reef, Daintree Rainforest and Mossman Gorge, it's time to relax and enjoy a picnic on Four Mile Beach. You can also drive up to Kuranda, a town set in the mountains behind Cairns. You can take the Skyrail Rainforest Cableway over the Barron Gorge National Park for a view like no other. Directions: You can fly into Cairns Airport and pick up your car rental. 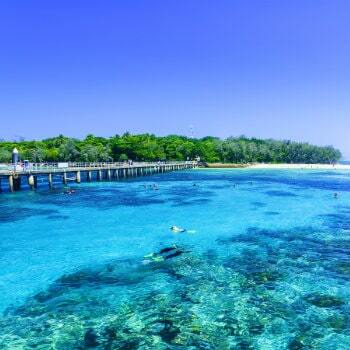 From there, drive north to begin your Great Barrier Reef drive. Tasmania's East Coast is a magical stretch of road which is where you will find Freycinet National Park, Coles Bay and the Bay of Fires. Tasmania is known as the food capital of Australia and the Great Eastern Drive is no exception. Think: fresh seafood, delicious fruit and world-class wine. Did someone say breathtaking views? 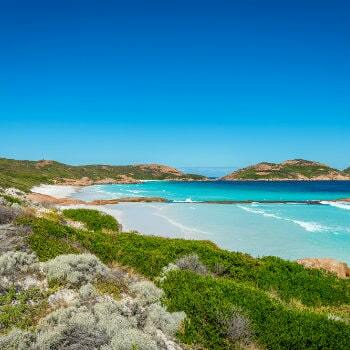 Check out Wineglass Bay Lookout and the Bay of Fires Lodge Walk. In reality, wherever you look, there are stunning views and interesting surprises along the way. That's why this road trip is ideal for a couple's getaway. Make sure you camp at Richardsons Beach Campground in Freycinet National Park and relax by the beach for a well-deserved break. Directions: To begin the Great Eastern Drive, fly into Hobart and drive one hour North East to Orford to start your journey.